In Japan (and most of Asia), business cards are a big deal. You need business cards! There's even a correct way to exchange them. So no wonder many Japanese cosplayers have business cards, too. Cosplayers having business cards is not new—and it's not limited to Japan by any stretch. I've met plenty of Western cosplayers with cards of their own. 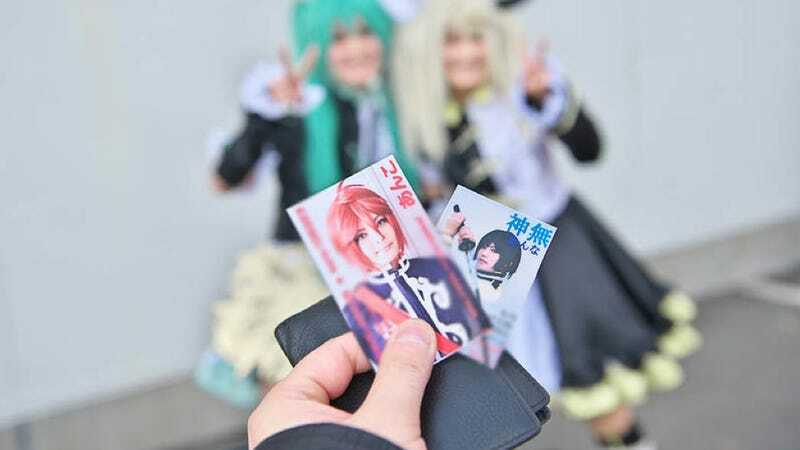 However, as Nikkei Trendy and ShiftEast.com point out, there are business card services in Japan that are aimed directly at the country's cosplaying community. Japanese printing company Choei, for example, has a cosplay centric business card service called Proof, which, as ShiftEast.com explains, allows cosplayers to order several sets of business cards, each of different outfits, for a reasonable price. One hundred cards cost around the equivalent of US$26. Instead of company names and job descriptions, cosplayer cards feature photos, character names, and website info. The cards look more like glossy trading cards, with full color pictures, than business cards. What's more, since many cosplayers have multiple characters in their cosplay repertoire, they might carry multiple business cards for their cosplay networking purposes. And those who are looking for the perfect background for their cosplay cards, they can always rent space at one of Japan's cosplay studios.